King crab and snow crab are the two most commonly known species sold in stores where the shellfish is not indigenous to the region. Many shellfish process centers cook and freeze the crab legs before distribution. They are shipped frozen, arrive to supermarkets or fish markets frozen, and then are sold frozen. 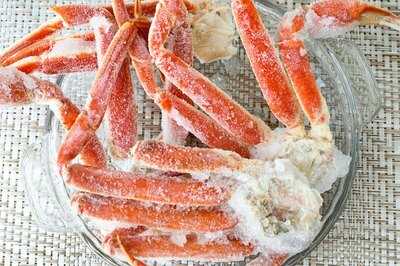 Some places may thaw out crab legs for display or hold them on ice for eye appealing displays. The problem there is, although the crab legs could be refrozen if desired (since they've already been cooked), they will retain water from being thawed when refrozen and lose flavor and texture quality. In markets that have the geographical advantage of selling fresh crabs or cooked, unfrozen crab legs, the crabs should be cooked within a day or less of purchase and the cooked, unfrozen crab legs can be stored in a refrigerated environment for 2 days before being frozen. 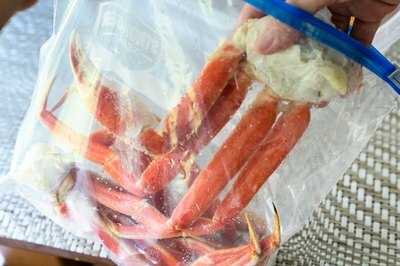 Crab legs can offer a challenging procedure for freezer storage if keeping them in connected leg segments or full-length portions. Because they are widely cooked and frozen from the processing and shipping plants, they're not pliable enough to store in commonly used freezer bags. Thawing them out to obtain pliability and then refreezing can cost flavor, texture, and shelf life longevity because of water retention. Finding freezer bags large enough to accommodate your desired length and or sections or functional and large enough freezer containers will have to be obtained and employed to successfully extend the freezer shelf life of the crab legs. The storage bags or containers should allow a tight fitting seal with as little air allowed into the storage chamber as possible. Oxidation inside the chamber can greatly decrease the quality of the stored shellfish and allow the buildup or crystalized ice formations on the product. While three to four months is recommended to optimize the full flavor of the crab legs, they can store in the freezer under the ideal conditions for up to six months without losing too much flavor or texture quality. Storing for longer than six months, while still edible, will result in compromising the full flavor and texture of the crab meat. Don't purchase crab legs to store in the freezer unless you're intending on using them within the six month time period. 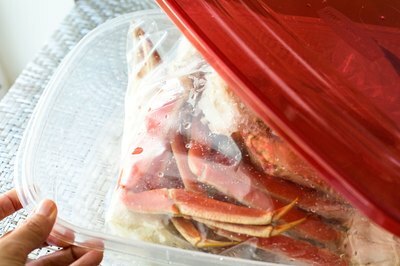 Wrap the crab legs tightly in freezer bags or with freezer wrap before placing in a sealed container to minimize oxidation. Label the crab legs with a storage date and an expiration date so you will not get confused by a single date on the package or container. Can You Refreeze King Crab After It Thaws Out?